This is rich in fruitcake and strawberry jam aromas; a deep, compelling and satisfying beer that is made to be savoured, not rushed. Delicious served cool, the dark ruby-red beer is full of dried fruit flavours and the perfect accompaniment for a mature cheese and pickle sandwich. 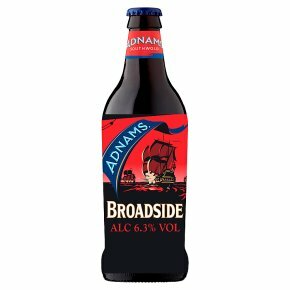 Broadside is brewed to commemorate the Battle of Sole Bay (1672). This dark ruby red beer is full of fruitcake flavours and is great savoured with some strong cheddar.